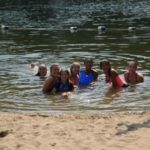 At Camp Ondessonk we agree to: 1) Take Care of Ourselves by staying safe, listening and following directions from counselors, applying sunscreen and bug spray every day, and reporting anything that doesn’t feel right to our counselors. 2)Take Care of Others by showing kindness and respect for fellow campers and staff through words and actions. 3)Take Care of Camp by not disturbing the animals and plants that live here, keeping camp clean from litter and graffiti, and caring for camp’s buildings and equipment like it is our own. Some of the major rules are outlined below. This list is not exhaustive, and common sense and prudent judgment should be used at all times. HANDS UP: This is how we get your attention at camp. When you see any counselor with their hand up, it means that you should pay attention and stop all conversations. RESPONSIBILITY: Campers must keep track of their unit shirt and try to keep it mostly clean. We wear them every day to dinner. If a camper brought something to camp that does not belong, tell a counselor right away and we can keep it safe and away from the unit for the week. For example; cash, electronics, snacks or phones are often used on the bus ride to camp but should not be in the unit. Counselors can store these items safely in the office and give them back to the camper before they depart. Any items that are found that should not be at camp will be confiscated by staff and returned at check-out. RESPECT: We respect our unit mates by being on time so that we don’t miss activities, by respecting quiet times at night and early in the morning when people are sleeping, and by using respectful language at all times. We also must respect our unit by keeping cabins, grounds, and the outhouses clean and reporting anything that is wrong with the unit. 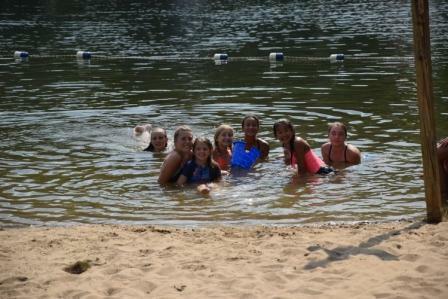 BULLYING: Camp Ondessonk is a place of acceptance for people of all kinds. Treat all people with respect, forgiveness, and kindness. Cruel, malicious, or any other bullying type behavior of any kind will not be tolerated. Be good to one another. You are all part of the Camp Ondessonk family, and should take care of each other! If you are being bullied by anyone, notify your counselors right away. If you don’t feel that you are able to get results from telling your counselors, tell another adult. Open health call is an OK time to talk to someone at the Health Center if you are having a tough time in your unit. THEFT: Stealing from others is never ok, and offenders will be removed from the Camp program immediately. Never go into another person’s stuff, and ask before you borrow anything, even from a friend. HEALTH CENTER AND FIRST AID: Your counselors have a first aid kit with bandages, ice packs, and other basic first aid. If you need something go to your counselor first so that they know what is going on. If they can’t help you or if you need more than what they can do, they will bring you to the Health Center. The Health Center has nurses on duty for more serious injuries and illnesses. The Health Center also holds all of the medicines that you bring to camp with the exception of emergency medicines such as epi pens and inhalers, which are with your counselors at all times. After breakfast and dinner, campers can go to the Health Center with a buddy and do not need a staff member. This is called Open Health Call. During open health call you can bring any issues to the camp nurses that you need help with. If you do go to the Health Center during open health call, let your counselor know that you went so that they can be sure to check on you later. WATER: Only drink out of approved faucets and spigots, not from other people’s water bottles (how germs are spread! ), from the foot washing station at the Beach Fire Pit, or from the creeks or lakes. Fill up your water bottle whenever you leave the unit at the water spigot there. If you forget your water bottle, tell your counselor right away. You will be able to borrow one from the Health Center for the day. CLEANLINESS: In order to best control poison ivy, find ticks, and keep ourselves healthy, we take full showers every day. Some people choose to wear a bathing suit in the showers. If that is the case, it is very important to wash everywhere, even under the bathing suit and to check ourselves all over for ticks, rashes, injuries, or anything out of the ordinary. If something is found, notify a counselor immediately. POISON IVY: Poison ivy is common at Camp Ondessonk, so learn to identify it so it can be avoided. If you believe you have been exposed, wash the area with soap and water immediately. Inform your Unit Leader, and monitor the area! WALKING ALONE: Never leave the unit without the knowledge of the Unit Leader. When allowed, please always explore in groups of three or more. Never leave the group or Main Area by yourself and never go back to the unit without a counselor present. Each unit has a meeting spot which is where you will meet before inspection each day and any time that your unit is about to go somewhere. If you are ever separated from your group and are not sure where they are, go immediately to your meeting spot in the main area. VISITING OTHER UNITS: Do not go into another unit of camp at any time. You may visit other cabins in your own unit if the campers from that cabin are present and if you ask them before you enter. CHAPEL: The Chapel should be used for Mass, Prayer Services, or private, quiet prayer. It is not a place to hang out and soak up the air conditioning. Hats are not to be worn in the Chapel. Food and drinks are not allowed in the Chapel. FOREST and ANIMALS: Do not harm or catch any animals including lizards and snakes. Trees are not to be carved or cut. Treat the environment as if you are a guest. In fact, we are all guests who enjoy visiting this beautiful place but do not remain and should always treat all living things that do live here with respect. When we hike or go on our overnight, we want to leave the forest the same or better then we found it without evidence of our visit. Fires are ONLY made in fire rings under supervision of staff. TRASH AND RECYCLING: We have trash cans and recycling bins at each unit, in the dining hall, and all over the main area. If you aren’t sure if something is recyclable, check for the recycle symbol printed on it somewhere. Recycling bins are only for cans and bottles. No paper goes into the recycling bins around camp. Camp Ondessonk is a place of natural beauty. Do not litter! CABINS: You should not write in or vandalize your cabin in any way. Campers who vandalize may be held liable for damages they cause. Do not climb in the rafters of your cabin. Cabins are inspected daily so be sure to make your bed is made, stuff is put away, and the cabin is swept. SWIMMING: Swimming is only allowed under supervision at appointed times. Never swim in Lake Echon (the boating lake), there are dangerous drop offs only a few feet from shore. SAFETY AROUND CAMP: You must wear appropriate footwear at all times when at camp. Flip flops are only allowed in the shower houses and not along any roads or paths at camp. All of Camp’s bridges are safe, however they are not made for running or pushing or horseplay. Fences are erected for a purpose. Do not cross them; there may be a cliff, drop off, or other danger on the other side. Never climb the large rocks without a leader. Do not throw rocks anytime at anything. LOST AND FOUND: Anything important that you find should be turned in at the Dining Hall. These items are then displayed at meals so that they may be returned. Watches, water bottles, backpacks should go there. Please take everyday use type items, such as towels, dirty clothing or toiletries to the Old Dining Hall. Always check the lost and found daily and before you leave on Saturday. 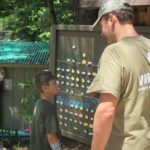 *Many campers with attention and behavior challenges are able to thrive at camp, however it is recommended that parents give us a call prior to registration to allow us to put the camper in the best situation possible for them. We do not have the resources at this time to provide supervision for campers who need one-on-one attention or are unable to function well in a group setting. All campers must be able to follow directions and exhibit safe and appropriate coping mechanisms when conflict arises.